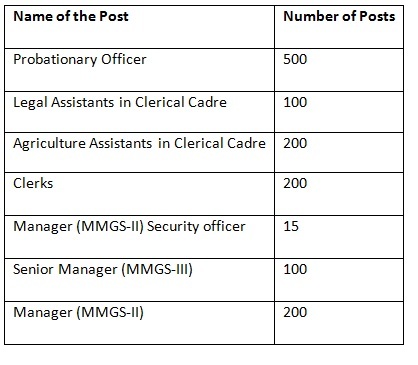 Bank of Maharashtra Recruitment 2016: Bank of Maharashtra has invited applications from eligible graduates for recruiting against 1315 vacancies in Legal Assistants and Agriculture Assistants in clerical cadre, Clerical Cadre (Non Conventional) Project, Manager (MMGS-II) Security officer, Probationary Officer, Senior Manager (MMGSIII) and Manager (MMGS-II). This will be a great opportunity for banking aspirants. Graduates willing to pursue banking career can now join Bank of Maharashtra by applying against 1315 vacancies. Who can apply for Bank of Maharashtra Recruitment 2016? Legal Assistants in Clerical Cadre: Graduation in Law from a Government recognized University/Institute. Candidate must be in the age group of 18-28 years. Agriculture Assistants: Graduation in Agriculture or Agriculture allied activities from a Government recognized University/Institute. Candidate must be in the age group of 18-28 years. Clerical Cadre (Non Conventional) Project: A graduate in any discipline from a recognized University. Candidate must be in the age group of 18-28 years. Manager (MMGS-II) Security officer: Graduation in any discipline from a University recognised by the Government of India or any equivalent qualification recognised as such by Central Government. Candidate must be in the age group of 28-45 years. Manager (MMGS-II): Minimum Graduation and Professional qualifications like MBA(Finance) / CA / ICWA / CFA / FRM / CAIIB. Minimum Two years Post qualification work experience in processing credit proposals of MSME, Mid Corporate and Large Corporate loans with any Scheduled Commercial Bank is mandatory. Candidate must be in the age group of 23-34 years. Senior Manager (MMGSIII): Minimum Graduation and Professional qualifications like MBA(Finance) / CA / ICWA / CFA / FRM / CAIIB from a University / Institution / Board recognised by Govt. of India / approved by Govt. Regulatory bodies. Minimum Four years Post qualification work experience in processing credit proposals of MSME, Mid Corporate and Large Corporate loans with any Scheduled Commercial Bank is mandatory. Candidate must be in the age group of 23-34 years. Probationary Officer: A graduate in any discipline from a recognized University. Candidate must be in the age group of 18-30 years. Candidates are required to apply against the vacancies by submitting their applications online at bankofmaharashtra.in along with fee of Rs 600 (Rs 100 for SC/ST/PWD). Before applying online, candidates should: (i) Scan their photograph and signature ensuring that both the photograph and signature adhere to the required specifications as given under Guideline for photograph & signature scan and upload. (ii) Have a valid personal e-mail ID and mobile no., which should be kept active till the completion of this Recruitment Process. Candidates have option for making the payment of requisite fees/ intimation charges through the ONLINE mode only. Legal Assistants in Clerical Cadre / Agriculture Assistants: The selection will be made on the basis of performance in the order of merit in Online Test conducted through IBPS/or any other examiner decided by the Bank and Documents & Biometric verification. Clerical Cadre (Non Conventional) Project: The selection will be made on the basis of performance in the order of merit in Online Test conducted through IBPS/or any other examiner decided by the Bank and Document verification. Senior Manager (MMGSIII)/ Manager (MMGS-II): Selection of candidates will be in two phases: ( I ) on the basis of online test conducted by IBPS or any other examiner decided by the Bank, (II) Personal Interview. Probationary Officer: The selection will be made on the basis of performance in Online Test, Personal Interview and/or GD. Candidates are required to submit their applications before 06 September 2016.